I have worked as a newspaper journalist for more than 30 years, beginning in 1982. During this time I also worked as a freelance writer and published in both secular and religious magazines. In addition to hard news stories, I have written profiles, human interest pieces, investigative stories, enterprise pieces, narratives, as well as scores of press releases and puff pieces for businesses and nonprofits. As a reporter, I covered local government, school boards, fire and rescue, police, military affairs and healthcare, among other areas. I also wrote editorials and op-ed pieces for daily newspapers. Below is a sample of my work. 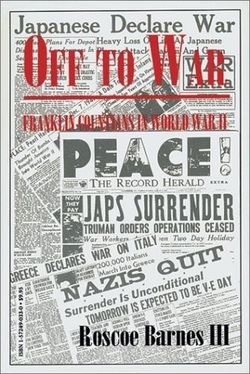 Note: My book, Off to War, (Foreword by Mark Nesbitt) is a collection of my newspaper stories on 13 World War II veterans in Pennsylvania. Martin Luther King's Living Legacy: King scholar reflects on his life as a preacher, orator, and Civil Rights leader. An interview with Dr. David True, Associate Professor of Religion, Wilson College, Chambersburg, Pa. See here. Cover story: Women make difference in ministry. See here. Thanks To Scottish Father/Son, Waynesboro Celebrates Its 200th Birthday. See here. Civil War landmark on the auction block. See here. Dove sculptures at school: Traditional symbol of peace sparks fierce battle over Islamic religion. See here. Atheists vs. Christians in Dueling Billboards in Chambersburg, Pa. See here. ON THE MEND: Senator returns to work after back-to-back heart attacks. See here. Man's Quick Thinking Saves Children. See here. Croft Pentz uses the printed page to preach the Gospel. See here. The Prayer That Saves: A Lesson from a Dying Thief. Available here. Some Franklin County voters hope to be part of history. Available here. Iraq war-related brain injury makes each day unpredictable for Shippensburg veteran. See here. Chambersburg area family in military since Revolution. See here. Shippensburg veteran experiences 'Christmas miracle.' Available here. AMERICA IS ANGRY’ Franklin County tea party supporters speak out, plan rally. See here. A Pentecostal Finds Grace. See here and here. The Rules for Enticing Your Prospects, Clients, and Customers by Turning Your Sales Message into Mouth-Watering Prose. Chapter featured in my book, Direct Response Advertising Made Easy (Entrepreneur Press , 2007). See here. Fatal feud leaves 1 dead, 1 wounded (with Jim Hook, Senior Writer) Public Opinion. See here. Farewell to a firefighter: Brotherhood of firefighters pays tribute to 1 of its own (with Tracy Panzer, Staff Writer) Public Opinion. See here. Shootings leave 2 dead: Woman flown to Hershey after Incident (with Tracy Panzer, Staff Writer) Public Opinion. See here. COMMUNITY REMEMBERS 'NEIGHBOR BETTY' Public Opinion. See here. Man Could Be U.S.’s Oldest Worker (The Record Herald, Waynesboro, Pa., and The Daily Herald, Tyrone, Pa.) Download here. Debra Wall came a long way to land top job in Franklin County borough (The Patriot-News, Harrisburg, Pa.) Download here. Vice President visits Gettysburg: Quayle addresses state firefighters convention, tours new fire station (The Gettysburg Times, Gettysburg, Pa.) Download here. Quayle A2 here. Reaction ranges widely on Vice President Quayle’s Gettysburg visit (The Gettysburg Times, Gettysburg, Pa.) Download here. Reaction 3A here. Sister hopes to give brother gift of life (The Record Herald, Waynesboro, Pa.). Read here and here. Community helps man in fight for his life (The Record Herald, Waynesboro, Pa.). Read here and here. Column: Trump’s marketing savvy (Enterprise-Journal, July 15, 2016). See here. Column: Trump supporters are blinded by rage (The Natchez Democrat, May 20, 2016). See here (for website) and here. Column: In Baltimore, don’t confuse protesters with rioters or thugs. See here. Our view: More access to legislative journals a welcome sign. See here. Our view: Tragedies, uncertainties highlight frailty of life. See here. Our view: Cut through poisonous rhetoric for the holidays. See here. Our view: Honor vets in a number of ways. See here. Our view: Welcome soldiers home. See here. Our view: Pledge should be recited in schools. See here. Finding Grace Behind Bars (Church of God Evangel, March 2016). See here. Right Place, Right Time (Church of God Evangel, October 2015). See here. Finding true strength: Seay warns about the perils of steroids. See here. Waynesboro optician back at work after crash. See here. Hero pulls driver from flames. See here. Summit man still upbeat, despite a lifetime of trials. See here. Man Leads Rescue in Fiery Accident. See here. Chambersburg firefighter reflects on saving 2 from fire. See here. The Role of Correctional Chaplains: Handout/Outline (2015). See here and here. Returning the Favor: A Message for Veterans Day (2014). See here. Seven Keys to Writing Success. Available here. By Robert Holt, Staff Writer, Gettysburg Times. Download here. Volunteer Service: How to Really Make a Difference. A brochure for WCCF Prison Ministry. Download here. Chaplain Resource Guide: FREE Bibles, Books, Literature, and Other Important Resources for Correctional Chaplains (Updated Nov. 16, 2016). See here. These short Gospel articles are "ripped from the headlines." Most of them use current events to illustrate the Good News of Christ. They are ideal for sermon illustrations and Sunday School lessons. Some are published as tracts. Most were published in Grace & Truth Magazine. “Julie was vacationing on the Hawaiian island of Maui when she took a morning swim near the shore of Kaanapali Beach and came face to face with a shark. She was enjoying her time in the water when she felt something slam into her body. A shark, about six to eight feet long, bit into her right shoulder and chewed her forearm before swimming away. Terrified, Julie tried desperately to reach shore..."
Fifty-two Passengers Rescued From Ship Stuck In Ice In Antarctica. See here. The Captain’s Sacrifice. See here. Where Will We Find Peace? See here. Evacuation Alert: Will You Heed The Warning? See here. Roadkill: The Tragedy Of The Groundhog. See here. Make That Distress Call Now! See here. SAVED FROM SOMALI PIRATES. See here. Are You Searching In The Right Places? See here. The Ultimate Bailout. See here. Do You Know The Price Of Protection? See here. What About Pollution? See here. Are You Headed The Wrong Way? See here. A Father And Son Respond To A Cry For Help. See here. ​(Grace & Truth Magazine). Read here and here. Lesson From A Dying Thief (Grace & Truth Magazine) Read here and here.